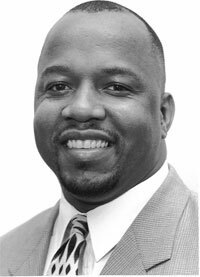 Tyrone Bledsoe, vice president for enrollment and student services at North Carolina Wesleyan College, has been named associate vice president for student services and dean of student life at Sam Houston State University. Bledsoe replaces John Delaney, who resigned in June to become dean of students at Ohio Wesleyan University. Bledsoe's selection was announced by Thelma Douglass, vice president for student services. He will begin his new duties Feb. 1, 2001. "I am extremely pleased with the search committee's work in identifying highly qualified candidates for the associate vice president and dean of student life position," said Douglass. "We are fortunate to have a person of Dr. Bledsoe's caliber join Sam Houston State University's staff. He comes with a wealth of knowledge and experience in student services. I am sure with his vast expertise and team approach, he will launch the student life department to another level in this 21st Century." "Sam Houston will be a good fit for me both personally and professionally," Bledsoe said. "This is an exciting time for me and for my family. I look forward to utilizing my talents and skills to further position the university in the new century while at the same time shaping the lives of the people who keep us in business--the students." Bledsoe was born and raised in Grenada, Miss. He received his bachelor of arts and master of education degrees from Mississippi State University. He graduated from the University of Georgia with a Ph. D. in counseling and student personnel administration and was chosen as the outstanding doctoral student in the State of Georgia. He has worked as a financial intern for the College Board's College Scholarship Service (CSS) Southern Regional Office; as associate dean of students at Georgia Southwestern State University; as adviser to black Greeks at the University of Georgia; and as assistant vice chancellor for student affairs at North Carolina Central University. Presently, he serves as the vice president for enrollment and student services at North Carolina Wesleyan College and is the college's first black executive officer. He is active in higher education issues and is recognized by several professional associations for his research, publications and presentations in the student affairs area. His primary areas of research and expertise involve developmental interventions, student leadership development, human development theories and diversity issues. He is the founder of Student African American Brotherhood (S.A.A.B. ), a ten-year-old national organization established to enhance the experiences of black males in colleges and universities. He is the father of one son, Tyrone Jr., who is 14.